Be the first to share your favorite memory, photo or story of Berthel . This memorial page is dedicated for family, friends and future generations to celebrate the life of their loved one. 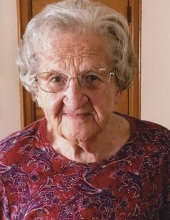 Berthel Mae Shafer-Turnes, was born May 29, 1932 and departed this life January 15, 2019, at the age of 86 years. Berthel was the eldest daughter of Gracie “Gay” Jones-Shafer and John A. Shafer and was born and reared in Sissonville, West Virginia. On April 16, 1960, married the love of her life Fred Lewis Turnes. They were blessed with two children, son, Garry and daughter Sandra Turnes-Slater. Also surviving are three granddaughters, Emily Turnes, Elana Miller and Lindsay Harrison, five great grandchildren, Blake Miller, Mackenzie Miller, Bryson Harrison, Brennon Harrison and Jace Turnes. Funeral Services will be 1:00 PM Friday January 18, 2019 at Floral Hills Garden of Memories Mausoleum Chapel. Burial will follow within the cemetery. Cunningham-Parker-Johnson Funeral Home is serving the Shafer-Turnes Family. To send flowers or a remembrance gift to the family of Berthel Mae Shafer-Turnes, please visit our Tribute Store. "Email Address" would like to share the life celebration of Berthel Mae Shafer-Turnes. Click on the "link" to go to share a favorite memory or leave a condolence message for the family.